Back when I was playing in dive bars, the 14-year-old opening act would always start their set by playing, all together and on stage, the tuning song: E, E, E, E, A, A, A, A, D, D, D… you get the idea. By the time they become closers, they discover plug-in tuners. 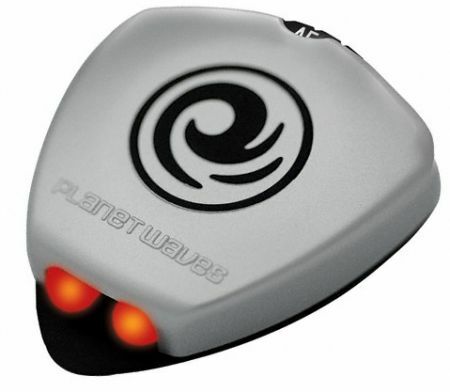 Now Planet Waves offers an even smaller and easier (on the ears) method of tuning up: the pick-sized sound-on-string tuner. Just dial in one of the six standard-tuning guitar notes on the back of the tiny device, strum the guitar, then shine the light from its strobing LEDs directly on the vibrating string. Adjust string tension until the lights stop “moving” and you’re ready to play. Street pricing starts around $20 — and in an ironic inversion of normal gear prices, just $15 for the bass version. Of course, if you’re a bassist, you’ll probably want to pick up both versions in case your guitarist “forgets” his. Um.. I don’t get it. Do you have to strum the string and then turn the tuning key until the strobes stop flashing? or just turn the keys and the tuner works via some sort of light refraction algorithm or something. ? Is it the sound/pitch of the string being played? or some sort of visual cue that extrapolates string tension somehow? From what I can tell, it simply flashes the LEDs at the frequency the string should be vibrating at, which is the frequency of the note. If it’s not correct, you’ll see the string moving with a frequency of the difference between the string and the light. As the frequency of string approaches that of the light, it will appear to get slower and slower and eventually stop as they match. If you have an adjustable strobe light and a fan, you can do the same thing to make it look like your fan has stopped while it’s running. It’s a good way to inspect moving parts without having to shut it down. An interesting take on tuning for sure, and I like the size. It is using a strobe effect to help you determine visually when a given string is in tune. However, it appears there is no ability for it to tell you whether it’s out of tune by being sharp or flat, so I’ll likely stay with my plug-in tuner that has LEDs to indicate +-. It works very well in noisy bars.